Hello people of the internet!!! On today’s ‘Monday Memos’, we are going to discuss everyone’s FAVORITE part of coming into a new season…NEW FASHION!!! Since today is officially the first day of fall (aka when you can officially start binging on pumpkin spice lattes from Starbucks), I thought that this was the perfect opportunity to do a ‘fall fashions’ blog post. Now I know that weather conditions vary depending on where you live, so I’m going to try to show y’all outfits that will keep you toasty, but aren’t boiling hot (you can alter it depending on what the weather is like in your neighborhood). I also tried to make these outfits school/parent approved. Hope y’all enjoy! Lace Trimmed Open Knit Sweater from Forever 21: I really loved this sweater because it’s lightweight, but still has a very “fall time” feel to it. The lace trim is also very cute, and something that keeps this sweater in style, so you can continue to wear it through the winter. ‘Matelassé’ Skater Skirt from Forever 21: I really like this skirt because it’s flowy, comfortable, and a way to incorporate our summer wardrobe into the fall season. Buckled Riding Boots from American Eagle: Ok, once fall hits, I become completely obsessed with boots. 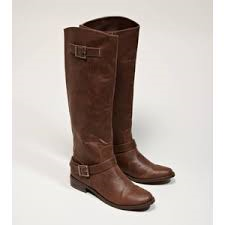 I really love these riding boots because they give the outfit a very polished look, and provide a nice balance to the skater skirt, which will keep you nice and toasty. Jet Set Logo Tote by Michael Kors : I love that this bag has a very classic look, and really adds sophistication to any look. A good bag is one of the most important accessories you can have, and this one gives off an “adult” vibe that is perfect for class or work. 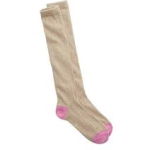 Knee High Socks from Aéropostale: I really loved these knee-high socks because they add warmth to the outfit, but also help the style stay cute and sophisticated. 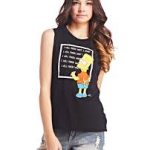 ‘Bart Simpson’ Chalkboard Tank from Wet Seal: Seriously who doesn’t love ‘The Simpson’?!? 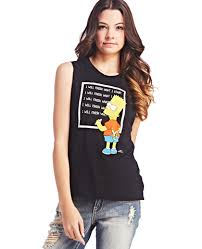 So why not be the coolest kid in school and show your that YOU are the biggest ‘Simpsons’ fangirl! If it’s too cold to wear a sleeveless shirt where you live, then you can add a simple black cardigan or jacket over the shirt so you don’t freeze. 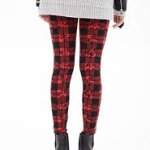 Plaid and Floral Leggings from Forever 21: I like these leggings for the look because, they incorporate the plaid look that was popular this summer (and is going to continue in the fall). 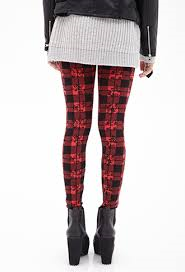 The leggings also have a light floral pattern on them, which adds an interesting flair to the outfit. 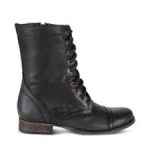 ‘Troopa’ Boots by Steve Madden: I like that these boots don’t have any embellishments, so they don’t clash with the leggings and tank. I definitely think that everyone should have a simple pair of boots like these, because you can pair them with a variety of outfits throughout the fall and winter seasons. 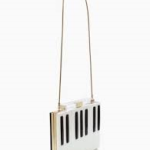 ‘Fancy Footwork Emanuelle’ Cross-Body Bag by Kate Spade: This bag is perfect for all of the music lovers out there! The keyboard design is very cool, and will definitely make your outfit stand out this year. 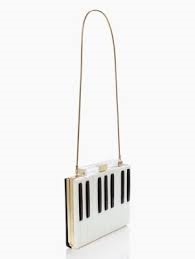 I also like that the crossbody design makes this bag easy to wear during day to day activities, but will also give any outfit a stylish flair. 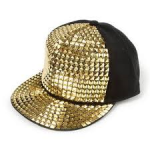 Stud Baseball Cap from Claire’s: I thought that this hat was the perfect finishing touch for this edgy look. The golden studs bring a nice complementary color to the leggings and tank, and add a cool edge to this outfit. ‘Clothes Before Bros’ sweater from Forever 21: Ok, can we just take a moment to discuss how awesome the wording on this sweater is! Now if you’re a fangirl of ‘One Tree Hill’ (I know you all are), then you’ll remember that ‘Clothes Before Bros’ was the name of Brooke’s clothing line on the show. Now I’m not 100% sure that that’s what this sweater was inspired by, but it’s still really cool. The sweater is also comfortable, light-weight, and something you can throw on when you’re running late, or just don’t feel like dressing up, but still want to look cute. Heart Printed Leggings from Wet Seal: I liked these leggings because they’re covered with white hearts that add a girly vibe to this casual outfit without any extra effort needed. The leggings are also comfortable, and perfect for school, hanging out with friends, or a date with a pizza and Netflix (just remember, pizza and Netflix is the solution to all life’s problems). 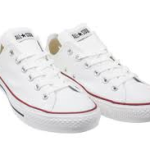 White Sneakers from Converse: Ok, I know that there’s that rule about not wearing white after Labor Day, but rules were made to be broken right?!? Right. 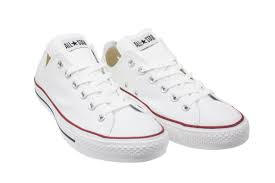 Personally I love wearing converse sneakers because they’re cute and casual, which makes them the perfect shoe for anyone who doesn’t want sore feet. 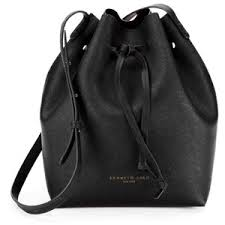 ‘Dover Street Saffiano Leather Bucket Bag’ from Kenneth Cole: As soon as I saw this bag, I fell in love with it because it’s easy to carry on all of your daily tasks, and it has enough room for you to take your entire life (aka your phone) anywhere you go. What’s really great about this bag is that it’s casual enough for school/work, but functional and fashionable enough for meetings and after school/work activities. 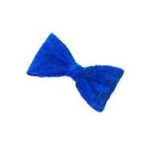 Mini Lace Bow Hair Clip Blue from Claire’s: Lastly, we have the perfect finishing touch for any casual look. If you’re running late or just don’t feel like putting any effort into your look, then you can put your hair into a ponytail or half-up half down look, and add this power clip as the perfect finishing touch. Don’t you love it when fashion is practical and cute! While I hope y’all enjoyed the looks! Remember that if it’s colder where you live then you can always add a cardigan or jacket, and if it’s hotter, you can substitute shorts or tank tops/short sleeved shirts. 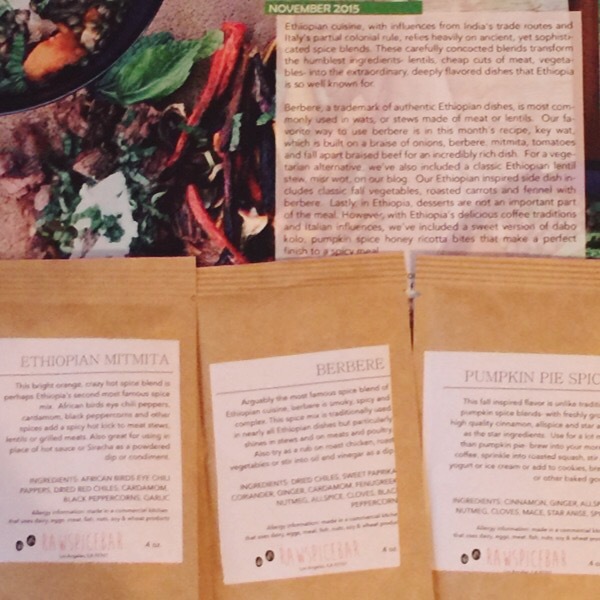 Have a fun fall people of the internet!!! All photos and information used in this blog belong to Forever 21, American Eagle, Michael Kors, Aéropostale, Wet Seal, Steve Madden, Kate Spade, Claire’s, Converse, Kenneth Cole, and all other original owners. I do not own anything in this blog. If any people, businesses, corporations, agents, publicists, agents, managers, PR agents, investor, or any others that deserve credit were not previously mentioned, credit for their work is now given to them, and their previous absence was purely accidental. All opinions expressed in this blog are my own. I wrote this blog for entertainment purposes and no copyright infringement is intended. celindareyesblog September 22, 2014 No Comments on Monday Memos: 2014 Fall Lookbook. Category: Monday Memos. Tagged: aeropostale, american eagle, baseball, book, boots, bow, Brooke, bucket, cap, cardigan, casual, Claire’s, clip, clothes before bros, cold, converse, cross body bag, dressy, edgy, fall, fashion, floral, forever 21, girly, hair, heart, hot, jacket, Kate Spade, Kenneth Cole, knee high socks, knit, labor day, lace, leather, leggings, look, Michael Kors, mini, one tree hill, plaid, ponytail, printed, riding, shirt, short, shorts, skater, skirt, sleeved, sneakers, steve madden, stud, studded, tank, top, tote, trends, Wet Seal. Hello people of the internet!!! This fall has brought many old styles back, such as varsity jackets, leggings, and infinity scarves however; many new styles are being ushered in. so what should you have in your closet this fall? 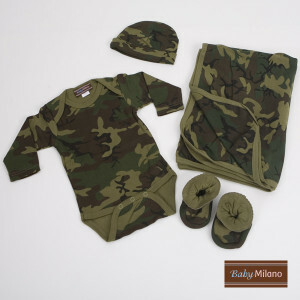 One word….Camouflage. 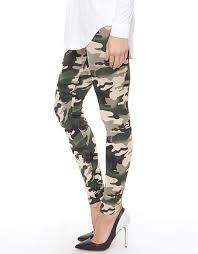 This style is found in leggings, shoes, pants, even boy and baby clothes, everyone can be fashionable this fall! (Ahhh!). One reason why I really enjoy this trend, is its’ versatility. You can wear a simple camouflage button up as a stylish way to stay toasty on those brisk fall nights (or days). You can also achieve a simple yet comfortable edgy style by wearing a camouflage pant or legging with studded combat boats(also hot this fall). This style trend is defiantly one to invest in because admit it, when style meets comfort, everyone wins. Even your favorite furry friend can strut to the dog park in style! 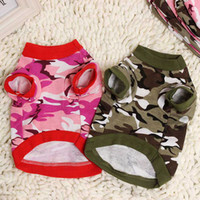 (I’m serious, they actually have camouflage jackets for dogs!…yup this idea definitely gets four paws up). Stay trendy my friends! 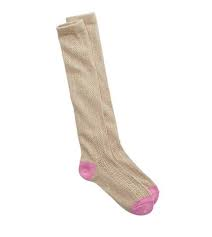 All photos and information used in this blog belong to Nike, guitar center, forever 21, sears, fabulouspetstore.com, Kohls, Dos Equis, the Dos Equis man, and all other original owners. I do not own anything in this blog. 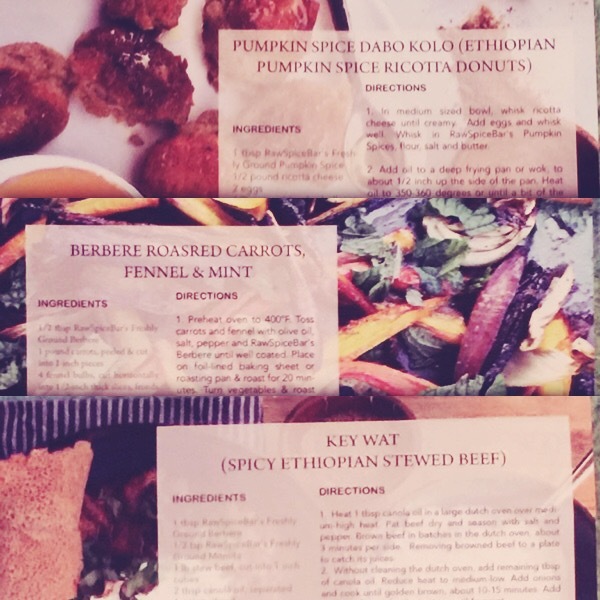 All opinions expressed in this blog are my own. I wrote this blog for entertainment purposes and no copyright infringement is intended. 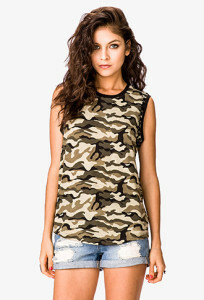 celindareyesblog June 21, 2014 No Comments on Monday Memos: Hot Trend This Fall…Camouflage. Category: Monday Memos. 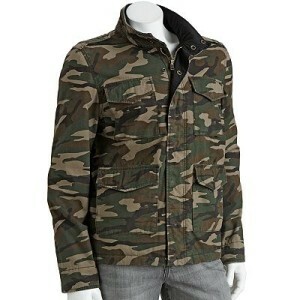 Tagged: camoflague, fall, fashion, hot, new, style.